Written by Matthew Parkes, Assistant Keeper (Curator of Geology), Natural History Collections at the National Museum of Ireland. Before you switch off, this isn’t another opinion piece on the ramblings of a dodgy political leader. 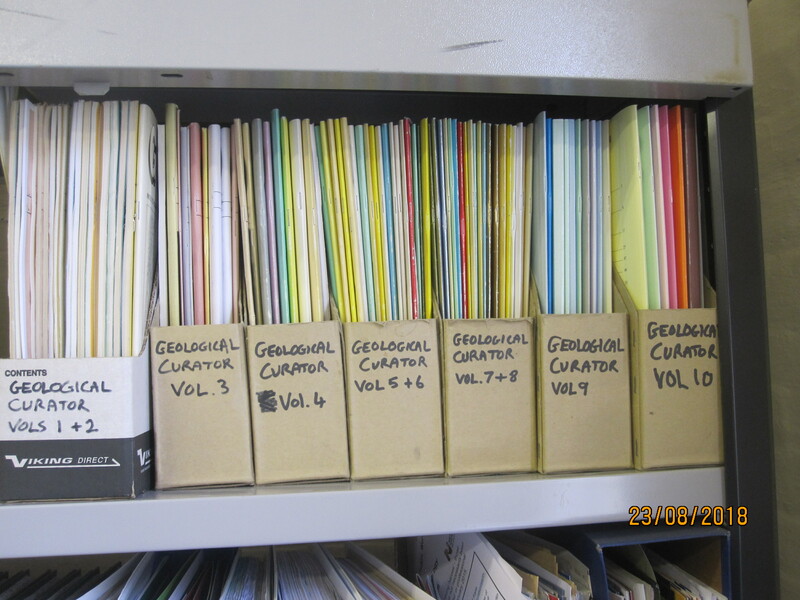 The ordinary life of a geological curator can be filled with difficult choices, confused by conundrums or made uncomfortable by, dare I say it, those we serve – the public. Without having a hard message to communicate in a gentle way, nor any strong viewpoint, I want to share some musings around this theme, as many experiences are probably common to geological curators everywhere. Of course I won’t be naming any names! Giving financial valuations to members of the public of cultural objects or natural science specimens is generally not acceptable practice in most museums. It’s in the rule book, the policies and codes we work with. No problems with that, yet at the same time if we are loaning specimens for an exhibition elsewhere, we have to put a monetary value on them for insurance purposes. If we go to a trade show and seek to buy anything from dealers, we mentally weigh up the price being asked for what is on offer versus some internal scale of value. Is it worth the price? So we assign a value to the specimen and then compare it to the price, and decide to buy, haggle, or walk away. If we have to make an offer of a fair price to a member of the public with a mineral or fossil or meteorite find that we wish to acquire, again we have to make a financial valuation. So, two strands of what we do as curators sit uneasily together. I suppose most of us find an accommodation that we can work with. If you are routinely attending trade shows or scanning trading websites and visiting rock and fossil shops you can learn the ‘going rate’ for many standard things, but so many natural science specimens have a very rare or even unique status that makes any financial valuation rather nonsensical. If you are just starting out in the sector, or from a museum without the resources to send staff to trade shows and the like, then how do you develop your experience of monetary values for specimens? I don’t have any answers to this, only questions. But maybe there is scope for some sort of mentoring scheme for curators across our network? 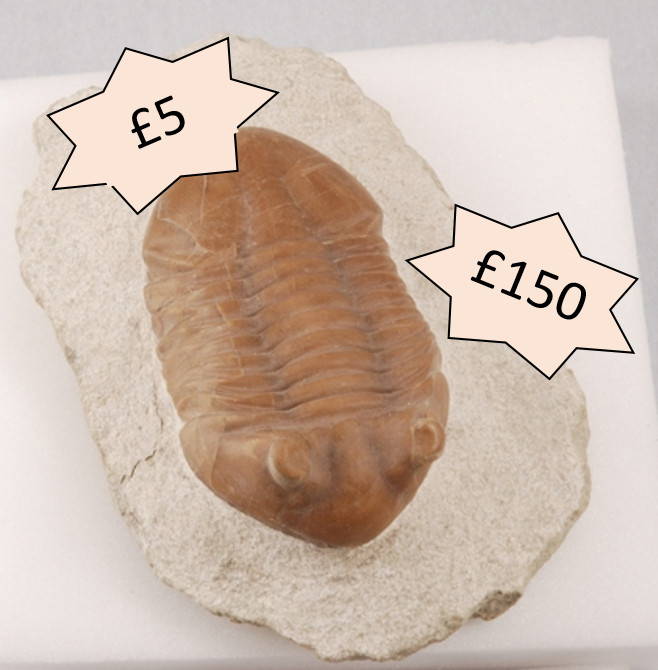 How much would you pay for this Asaphus trilobite? Which is the fairer price? How do you know? © Horniman Museum and Gardens. For most curators, undertaking identifications of specimens for members of the general public is an essential task in the delivery of a public service to the community your museum serves. In general, this can be one of the most rewarding aspects of the job. Frequently the specimens can be the same old regulars: nodules, slag, common local fossils, ‘hand axe’ shaped rocks and so on. They may be common enquiries to us, the curators, but to the person who has brought them in, they are sufficiently interesting and curious to energise them into contacting the museum. For me, endeavouring to explain the specimen as clearly as possible, and to be enthusiastic about it and what can actually be learnt from it, is really important. It won’t ever show up in statistics but the job satisfaction of seeing a ‘happy customer’ go away with their find and a new found enthusiasm for the Earth under their feet is its own reward. Whilst most people are thrilled to learn the age of something, or the processes that created a specific rock, or even that their ‘dinosaur footprints’ are actually the result of weathering processes, there are occasionally people who challenge your patience. I suspect most geological curators have had someone pay a visit with an identification enquiry that could not be recorded and ticked off as a positive result. As examples, I can summarise two suspected meteorite enquiries I have dealt with. In one example a large bag of beach pebbles had to be identified, all of which were believed to be lunar meteorites by the visitor. No amount of enthusiasm about their possible identities and origins could ultimately mask their fundamental disappointment in my determinations. I was also left with a nagging feeling of disappointment that my advice was probably not believed. In a second example, a visitor had a stone that they believed to be a meteorite, and had been observed ‘as a fireball that fell close to’ the person’s home. I had absolutely no reason to disbelieve any aspect of the circumstances of the story, yet I had no explanation that could match the visitor’s belief. A little internet is a dangerous thing since some pictures and descriptions on NASA’s website that had some blurry resemblance to the stone were the basis of a conviction that could not be shaken by the fact that I identified it as a probable piece of lime mortar. Ultimately, the second opinion of my colleague was necessary to end the impasse, and the affair left a feeling of dissatisfaction. Such unresolved interactions with the public are fortunately not too common, but the potential is always there, every time we answer the phone or open up our email. One of the candidates for ‘dinosaur egg’ was this very fine pyrite shell of a nodule from Carboniferous rocks in the Slieve Aneirin (Iron Mountain) range in northwest Ireland. © Matthew Parkes. As the current editor of the Geological Curators’ Group journal The Geological Curator, I occasionally have wobbles of confidence that I am doing the job right. Mostly this happens with the submissions that are new and different, or occasionally, dare I say it, slightly odd! The conflict of judgement arises in balancing a desire to encourage potential authors and the fear of lowering journal standards or reputation by including poor quality material. I guess most editors must have this problem at some time or other, but I think it probably arises more often with The Geological Curator than with many other journals, simply because we encompass such a diversity of collections, institutions, curators, enthusiasts, and/or professionals with an overlapping interest on occasion. When there is a submission on a very standard topic by an established geological curator, life can be straightforward, but in almost every issue of the journal there might be something published that is by a first-time author, an amateur enthusiast, a specialist in another discipline with a geological angle, or someone whose background and motivation are opaque to me. Sometimes enquiries from potential authors involve extensive discussion as to whether their idea is appropriate or relevant for the journal and the decision, in the end, may be to look elsewhere. In other instances, enthusiasm on my part for some topic that I think would interest members, may eventually lead to submission. Then of course, even if I think a paper is suitable for publication myself, I have to find an unbiased referee with the competence to tackle the material. When it falls into a space that I have some concerns about, but when I have invested time in supporting the author to submit, I await a referee’s report with trepidation, in case their recommendation is to reject it entirely. If I have sought out the submission in the first place, based on hearing a talk or seeing some mention elsewhere, then it becomes an unpleasant situation to be in! Whilst I have only heard very occasional whispers of discontent over individual articles, I suspect there are members who would criticise the publication of individual papers on a routine basis (I am open to hearing such criticism, if it exists) but whenever someone new is willing to take on the editorial role, they should be aware that this balancing act can be emotionally wearing. One of the recent enquiries I dealt with partially prompted this blog piece. A gentleman wanted some confirmation that a fossil he had acquired was genuine. From a photograph I had some suspicions but could not be certain, so he visited with the specimen for me to assess it properly. Whilst it was a genuine ammonite from Morocco, there had been considerable intervention in the middle segment with the ribs and the coiling essentially carved out. I was able to show the man some other examples of such practices. 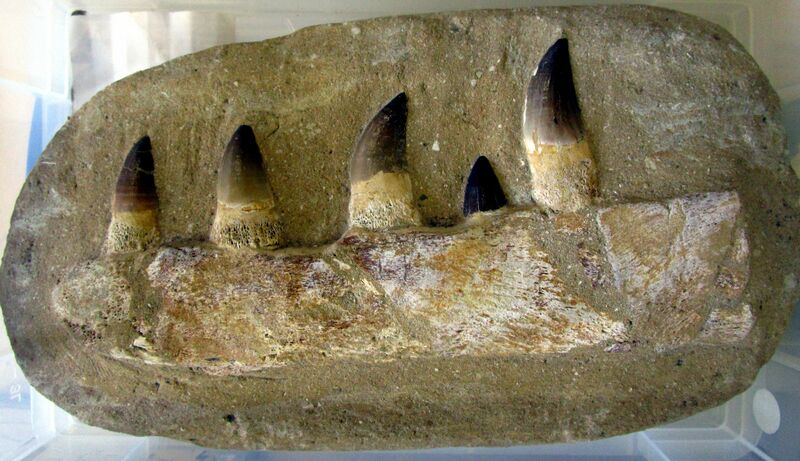 A mosasaur jaw, recently donated to our museum, with many teeth present, could demonstrably show a high degree of fabrication with bone fragments and isolated teeth made to look like a complete jaw. Another superb trilobite specimen, with part and counterpart in a broken nodule were entirely replicas in resin, but highly believable as the real thing. Whilst geological curators are probably mostly well aware of the inventive practices of some workshops in Morocco, the general public who might buy fossils from these sources may not be, in which case they are essentially being misled, at best, and totally defrauded, at worst. When people are essentially buying a curio or a holiday souvenir then the damage of such fraud is limited, but if the forgery is sophisticated and concerns specimens that are considered scientifically important and which may be described in the literature, then the risk to our science is great. This broad topic will be the subject of a GCG workshop in late September 2019. We plan to hold this meeting in Edinburgh and a set of experts will present on a wide range of fakes, forgeries and related matters. As well as fossils fakes, we will explore mineral fakes and treatments, including gemstones, amber and other materials. 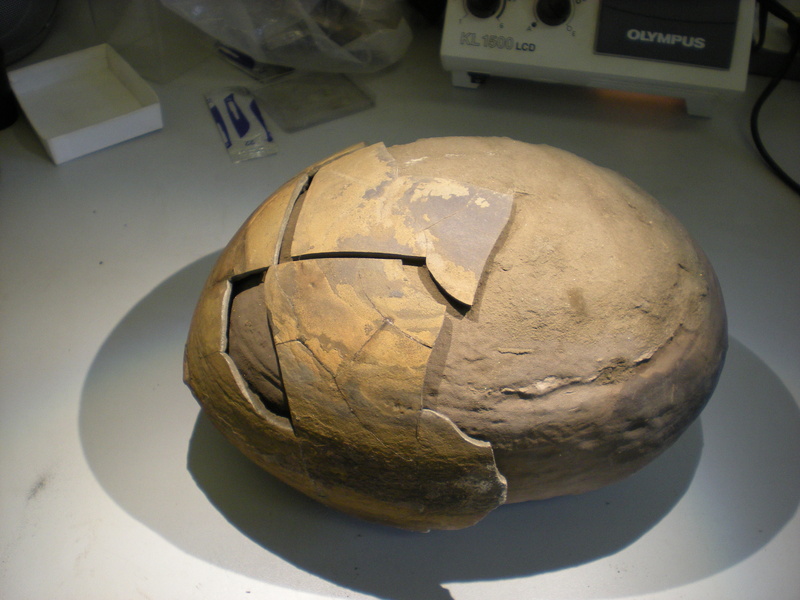 It is likely to be invaluable for a diverse range of curators, not just geological specialists. Look out for further details to be advertised soon. You can see, upon close inspection, that this ‘mosasaur jaw’ is a composite of fragments of bone. To the trained eye, the teeth don’t look right either! © Matthew Parkes. As a final note to close this blog, it is an unpleasant but necessary task to warn geological and natural science curators everywhere, but perhaps especially those in smaller to medium sized museums, of a potential threat to the integrity of their collections. It has been reported by many people that there is at least one person misrepresenting themselves as involved with major museums, looking for material and co-operation in a major new exhibition (or variations of this sort of thing). GCG would warn all curators to be alert for any such approaches about access to their collections. Please contact GCG for advice or checks if you have any concerns about the authenticity of anyone seeking access to, or loans of, your collection. How very true all of this is! When I answered public enquiries during the latter years of my service in a National Museum, we were occasionally offered specimens (mineral) for sale by the owners. These ranged from the relatively humdrum (but interesting) to the exotic (and definitely interesting!). I was often asked what we would pay for an item, but told the owner that we didn’t make offers, and they had to come to us with a fixed price. I told the owners that if I made an offer, they could go away and use that with a 3rd party to get a better offer, and maybe then come back again to us looking for an improved offer. We would not enter a bidding war. But on rare occasions when a price was quoted, we then began to say that ‘we’ thought it was too high, in the hope that they would lower it ! The hypocrisy in this was not lost on me….. I too had many examples of ‘the meteorite I found’ but of the several thousand enquiries I dealt with, only about 6 were meteorites and, and none from this country. I soon learnt that 99% of the public had no idea what a meteorite looks like (why should they? ), nor how it is formed, and tales of ‘seeing it fall’, ‘that it made a crater’, or ‘that it was hot’, or’ that they had seen the fireball’, told me pretty well that this would be something else. The notions of flaming balls smashing into land masses and making a crater was the result of watching too many Hollywood movies! I too had to disappoint many people. Some of them simply didn’t believe me and we had to agree to disagree. Others sent me (mostly from overseas), weird analyses they had had done (and authenticated with an official stamp), but without any idea of what had been sampled. or how it had been carried out. Others sent awful pictures expecting an identification; the worst I remember was one of a single bed with a small (probably fist size or smaller) black specimen in the middle. Given that the entire bed was visible, you can guess how small the black blob was! I could not believe how poor photography skills were. Getting it blurred maybe one thing (we have all done it), but photographing the entire bed was something else!! It was also clear that some (again mostly from overseas) wanted ‘authentication’ from a National Museum so that they could put the item on the market. One had to be careful not to supply this without seeing an actual specimen, and ideally without keeping part of it for reference. Usually a response which asked for a sample elicited no further replies. I didn’t see many fabrications (fakes) in the mineral world (apart from the normal Moroccan ones) but one did occasionally get ‘accidental fabrications’. One instance of this was where some agricultural fertiliser had been dumped and had, over time, reacted with the strata (usually chalk or limestone) to form sometimes brightly coloured secondary compounds. Luckily I had access to some sophisticated equipment (notably the mineralogists’ fingerprint system – X-ray diffraction), to try and sort them out. But some were just too awkward to identify, or were organic and not crystalline and so produced a poor, or no, pattern. These had to remain in the ‘pending’ tray, I’m afraid. I could continue, but maybe this isn’t the place. I do have a proto-paper recalling much of my time as the enquiry officer, and maybe one day I will publish it. At the museum where I work we have had individuals repeatedly bring the same object back to different members of staff in an attempt to get the identification they wanted. In some cases this was to have an item declared unusual so they could sell it elsewhere for more money. We initiated a detailed log for identifications for the public; and some commercial dealers were told they would be charged if the purposes for identification was validation to increase cost. Most visitors are happy with their identifications but a few cannot be persuaded their piece of concrete isn’t a dinosaur head. It isn’t just museums that find themselves embroiled in attempts at fakery; I visited a shop in southern England this year to be told the “250 million year old Trilobites” on sale had been sold to them by a dealer who had personally collected them from the nearby Hampshire shoreline (they were labelled as such), and that the dealer had told the shop that part of the increased charges were going to a national project called the Hampshire Geology Project being run by the NHM. No amount of persuasion that trilobites were far too old for this coastline could persuade the shopkeeper otherwise. While I’m sure Matthew didn’t intend to elicit too many trips down memory lane, I am grateful to him for reminding me of the days just after the school holidays back in the 1970s when those of us at what was then The Geological Museum on Exhibition Road looked forward to the annual post-seaside-holiday lunch time visits by folks with their gleanings, sometimes still in the plastic bucket. While most were the usual shells, ammonites, belemnites and so on, two stand out in my memory. A large piece of grey “rock” found on the seashore somewhere bore an intriguing elongate marking that the finder thought might be the cast of the sort of orthoconic nautiloid he had seen in shops and exhibitions. In fact it was clearly a trace fossil, a track, but to explain that what he had was the remains of a solidified bag of cement over which someone had ridden a motorbike while it was setting. required some empathy and a certain amount of spin. Coffee time was spent musing on nomenclature based on Pirelli sp. Then there was the plastic carrier bag of ambergris washed up somewhere and lovingly retrieved and carried home despite the odour in the hope that it had value. Similar finds have been reported in the news over the years since, I recall. There really is no easy way to make a large lump of used cooking fat seem more exciting and like Matthew I was left feeling that the enquirer doubted my expertise and wondering whether she would take it straight round to The Natural History Museum for a second opinion, or whether she had just come from there.